The Pioneer CDJ-400 system does away with whatever advantages vinyl has over regular CDs where DJs are concerned, as it boasts a new feature known as ‘vinyl mode’. In this mode, you will be able to interact with a CD the same manner one would do with a record – the moment you touch the platter, the disc will stop, while moving it forwards and backwards will enable you to scratch, and queuing the next track ready is but a snap. With the inclusion of an outer ring, it allows the DJ to push and pull the CD, increasing or decreasing the track playing speed accordingly. Guess there really isn’t much reason to store vinyls any more other than for sentimental value. 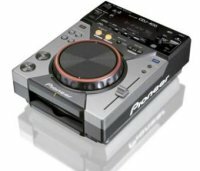 The Pioneer CDJ-400 will retail for approximately $876.